SLC series Mouvex pumps are made of ductile iron, making them more affordable and cost-effective option for industrial / chemical applications compared to SLS series pumps. 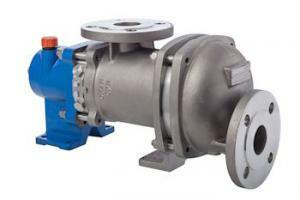 SLC pumps provide solutions for air sensitive and shear sensitive products (up to 8m3/h) maximum pressure 16 bar. This pump provides very high suction and discharge pressures, which allow it to self-prime and fully strip lines, maximizing product recovery. SLC pump can run dry for up to 5 min, and the self-compensating eccentric disc principle provides consistent flow rates over a long period of time. The flow rate is extremely accurate even at low speeds.